Compost worms (Eisenia fetida) known by many names Red wriggler being one of the most commonly used ones are pretty hardy creatures and can tolerate a wide range of temperatures going as low as 5 degrees C / 41 F and as high as 30 degrees C / 86 F.
In many parts of the world this will be in most cases ok but in extreme summer or winter conditions worms can and will die if they are not protected against hot or cold conditions. 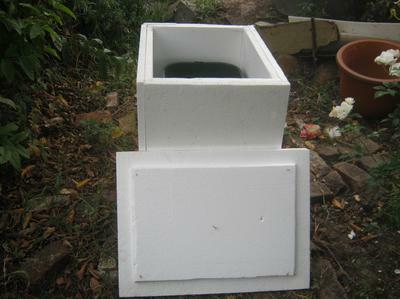 If you don't have the opportunity to keep your worms protected indoors a polystyrene box that can house the worm bin can be used to insulate the worms against extreme weather conditions. It's not very costly and easy to build. We bought some 5 cm / 2 inch poly boards at the hardware, cut it with a sharp knife and used toothpicks to hold it together.